September 2007No matter how many times we unwrapped these fragrant parcels to reveal the most gorgeous brick-red sauce and succulent meat, we were stunned all over again that we were standing in our test kitchen in New York City and not right in the middle of Mexico. 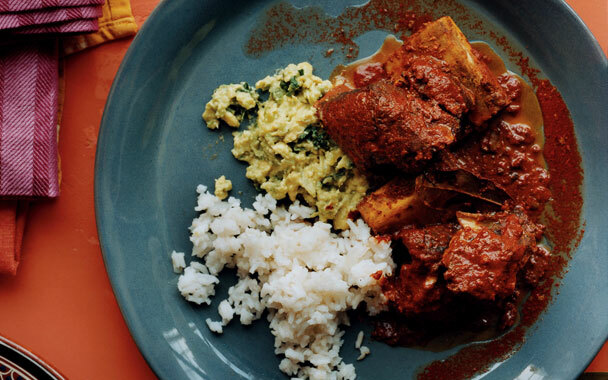 Guajillo chiles, mild and sweet, lend their hue and characteristic flavor to the meat—typically lamb, though our short ribs translate beautifully—penetrating all the way through during slow cooking. Since the beef sits right on top of bone during the braising, it releases a meatiness into the sauce as well. You’ll be similarly (meaning happily) shocked that something this richly authentic can come out of your own oven. Fill a 2-quart saucepan halfway with water and bring to a boil. Meanwhile, slit chiles lengthwise, then stem, seed, and devein. Add chiles to boiling water and remove from heat. Let stand, uncovered, until chiles are softened and have turned a brighter red, about 10 minutes. Meanwhile, toast annatto and cumin seeds in a dry small heavy skillet over medium heat, stirring, until fragrant and a shade darker. Transfer to a bowl to cool, then grind seeds to a powder in grinder. Transfer chiles to a blender with a slotted spoon, then add 1 1/2 cups soaking liquid, ground seeds, garlic, vinegar, and 1 tablespoon salt. Blend until smooth, at least 2 minutes. Pour sauce into a large (3- to 4-quart) shallow container and cool to room temperature, about 10 minutes. Sprinkle meat with 2 teaspoons salt, then add to sauce and turn meat to coat using tongs or your hands (wear protective gloves to prevent staining). Marinate meat, covered and chilled, at least 8 hours. Holding both ends of a banana leaf, drag leaf slowly over a burner on medium-high heat until it changes color slightly and becomes shinier. Repeat on other side of leaf, then toast remaining banana leaves. Cut off tough edges from banana leaves with kitchen shears, then cut 8 (11-inch-square) pieces from leaves, discarding remainder. Put each leaf on a 12-inch-square piece of foil, then arrange 2 pieces of meat and some sauce in center of each leaf, using all of sauce, and top each mound with a bay leaf (or, if using California leaves, with half a bay leaf). Fold in all 4 sides of each banana leaf to enclose meat, then wrap tightly in foil. Arrange packages, seam sides up, in 1 layer in a large roasting pan and add just enough water to measure 1/8 inch in bottom of pan (about 2 cups). Bake, adding more water as necessary to prevent pan from becoming dry, until meat is tender and falling off the bone (open 1 package to test), about 3 1/2 hours for beef or 2 1/2 hours for lamb. Discard foil and bay leaves and serve meat in banana leaves if desired (do not eat banana leaves). Meat can be marinated, in bowl or enclosed in banana-leaf packages, up to 24 hours. Meat is best eaten from freshly baked banana-leaf packages, but leftovers keep 3 days. Reheat, wrapped in foil, in a 350°F oven, 20 to 30 minutes.